Jeff Salomon asks how, after having "a pretty good career" in physics for many years, Brian Greene decided to get a second career as a science writer. Brian Greene. It wasn't really that I awoke one day and decided to do it. I was asked maybe 10 years ago to give a popular level lecture, at [University of Colorado?] on string theory, and after I gave that talk, some of those people came up to me and asked what they could read to learn further about the subject, and I realized there wasn't really anything out there that brought people up to date. That would be the most immediate impetus. But I think that the more general motivation is, I think that we are all part of a journey that our species has been on for a few thousand years. [It's trying] to reveal the workings of the universe and the sad thing is that for the last hundred years or so that journey has been framed in a language most people don't speak: the language of mathematics. So many people get shut out from being able to know. So it was my hope that a book like this and many others as well can start to bridge the gap between the [everyday] language, the language in which we are comfortable thinking about things, and the language, unfortunately, that cutting edge developments are framed in: mathematics. The idea is, to do research you still need math, but not if you just want to know what's going on. Jeff Salomon asks how the audience in Austin compares with other cities Brian Greene had visited during his book tour. Brian Greene. You know, it depends on where you are in the country, but by and large the interest in high. We've been averaging a 1000 people a night in the most places in the country. Jeff Salomon asks what kind of people come to these meetings, who is Brian Greene's primary audience. Brian Greene. You know, I don't have a very good answer. It's a wide range of people. What I do have a clear sense of [who my audience is], is when people send emails. Since this book has come out, and the Nova series I got of the order of 15,000 (?) emails. And there really are some from kids as young as 5 or 6, which is very surprising to me, some from older people, some from working professionals, who enjoy physics but long ago gave up a dream of working in the field and just want to know what's going on; and doctors, lawyers. There was a truck driver who wrote to me from West Virginia that his friends are mad at him because he's not hanging out with them any longer, [doesn't go to] bars [but is] reading these books. (Audience laughs.) I thought that was pretty cool. Jeff Salomon asks what kind of emails 5- and 6-year-old children send him. Brian Greene. [For example,] what happens before the Big Bang. Questions that many of us I think ask ourselves at one point. But as we get older, we start to think that somehow those are silly questions, or questions that you don't really ask any longer. And that's very sad, because [these are] important questions, and I think it's wonderful when somebody as young as that wants to raise that issue. And my hope again is that these kind of books will inspire people to not clamp down on the curiosity about the universe. Jeff Salomon asks, has Brian Greene ever thought of writing a children's book? Brian Greene. [Were I to write] another book, it would be a children's book. I think that there really is a need for books that start at a level as young as [...]. "The Elegant Universe" is not an easy book. For example, my mother opened it, got about as far as the dedication (audience laughs), and a few pages later said it gave her a headache, and put it down. "Fabric of the Cosmos" is, I think, more accessible. It is, I think, not particularly easy, but [it's not as technical or as mathematical] as "The Elegant Universe", and my mother got through that book. Brian Greene. There were points where my editor might say, "I'm hanging on, but only by a thread", or, as the case may be, by a string (audience laughs), "and can you give me something -- another analogy, another little story, to keep me engaged in the text?" But, you know, the thing about me is I find many, many things very difficult. And I find physics very difficult. And I think that when it comes to writing a book like this, [I don't think the stuff I write about is that easy, everyone's gonna get it], no, I find that it's tough, and it takes a really appropriate metaphor, or story, or analogy, or a visualization to get it. And I personally don't think I managed to learn anything by just relying on mathematics, I think what I need to have is a visual state of mind, a visual sense of what it is that a physicist is trying to tell me, and that's what I'm trying to do in the books: to focus on that visualization. And the fact that I need it myself means that I don't come as [...] rejecting of, as "this is all too easy". Jeff Salomon asks about the influence of Carl Sagan or other science popularizers on Brian Greene. Brian Greene. If I had a voice inside, [for example, a Carl Sagan's voice inside my head], it wouldn't be good, because I wouldn't want to sort of be influenced, or contaminated by other voices... that are wonderful: I mean, I know how well people think [of Sagan and] other authors that you mentioned. But I didn't want to somehow be an extension of or a variation on other authors, [I wanted my approach to be] authentic. Many people, before they write a book, they write a chapter and then sell it. They sell a book to a publisher and then they finish the book already on their clock. I wrote "Elegant Universe" without telling anybody, because I didn't want anybody to know I was writing it, in case it sucked (laughter in the audience) and I had to throw it away. In case I had to throw it away, I wanted it to be a completely personal experience than a public one. I really just wanted it to be for me. If it was gonna be for me, I wanted to see whether or not it was gonna work before [I submitted it to a publisher]. Jeff Salomon asks what are people going to get from Brian Greene's new book that they didn't get from "The Elegant Universe"? Brian Greene. Well, if I were to summarize what the first book is about, I would say, it's about the search for the unified theory. But "Fabric of Cosmos" is a very different book. [It's a] published story of space and time. And space and time are in a way far more familiar to us than string theory. So the subject matter of the book is closer to the everyday experience. What makes the second book more mind-bending is it challenges things we hold very sacred and very dear about how the world was put together. We all have preconceived notions about space and time. I don't know [if there are many people that have] preconceived notions about unified theory or about strings. When you read "The Elegant Universe", [you see] that the idea that the physicists have come up with is very interesting and very provocative, but it does not really challenge some original picture of reality that people internally have. The second book does challenge, and, I hope, tears down the preconceived notion that we have about reality while challenging the very [fundamentals] of reality that is the space and time. Jeff Salomon asks, at some point, did the concept of relativity become second nature to Brian Greene? Brian Greene. I don't think it ever totally becomes second nature. I certainly got very used to the idea of relativity, and therefore I can go into that frame of mind without it seeming like an effort. But I FEEL and think about the world as being organized into past, present and future. I FEEL that the only moment in time that's really real is this moment right now. And I feel [that what happened a few moments ago] is gone, and the future is yet to be. It still feels right to me. But I know in my mind intellectually that's wrong. Relativity establishes that that picture of the universe is wrong, and if I work hard, I can force myself to recognize the fallacy in my view or thinking; but intuitively it's still what I feel. So it's a daily struggle to keep in mind how the world works, and juxtapose that with experience that [I get] a thousand, even million times a day from ordinary comings and goings. Jeff Salomon asks a question that could barely be heard... it's something along the lines of what inspires Brian Greene. What caused him to study physics? Brian Greene. I guess I have to downplay the formula [...] Questions that many of us ask ourselves, you know: why am I here? What is this universe, what is the point of it all? And what quickly became apparent to me was that since many people have thought about these questions for so long and still don't have reasonable answers to any of these questions, it is unlikely that anything that I would do would contribute something new or different. So then [I thought], if I understand the context of [those deep questions], if I understand not the "whys" of the universe but the "hows" -- how the universe comes to be, how is it governed by laws of physics, if I at least consider answers to the "how" questions, I might be a little more comfortable not knowing the answers to the "why" questions. And that's pretty much what has happened to me: I find that understanding as best we can of how universe came to be at least makes me a little less irritated, or scratched to my soul, to not know the answers to any of these questions. Jeff Salomon asks a question that could not be heard. Brian Greene. I think so. But the things to bear in mind, especially to the younger people, who might think of going into physics: like any other field, physics has its bad days and has its good days and has boring stretches and has difficult stretches, and [calculations?] you have to do, you don't feel like doing it, but you have to in order to the next step. I mean there is a the nitty-gritty to this subject which underlies the beautiful ideas that ultimately emerge from that kind of a search. So indeed, I do hold on to the wonder and I hope that passion of those early days that personally thrust me in the direction I now study, but of course, you have to ultimately do the work, and the work itself is tough, and that's what math comes into that particular endeavor. My books kind of shield the reader from the math, but if you actually want to continue to the next step, there is no way to avoid learning the math. Jeff Salomon. Can you give a quick definition of string theory? One, what [does string theory] purport to accomplish? That is, to find the unified theory, a framework that might describe all physical phenomena from one single set of principles. That's its goal, that's what it hopes to accomplish, and many people think that it is the theory that will accomplish that. But as far as what string theory actually is, how does the theory actually work, that, I think, is pretty simple to explain. The theory tries to answer the question that people have asked for a few thousand years, which is, what are things made of? What are the fundamental entities making up matter in the world around us? So if you have a wood table over here, and you cut the table in half, cut through many pieces of wood in half again, and keep on cutting into ever smaller pieces, the question is, where does the cutting stop? Where is that [...] that can't be cut no further? Now we know if we go small enough we get atoms, but that's not the end of the story: they can be cut, they can be split. Electrons revolve around the nucleus, and neutrons and protons have finer particles inside of them known as quarks. That is where conventional theory and experiment data stop: these little dot-like particles -- electrons, and quarks and a few others [...]. Now, string theory then takes off at that point and suggests -- I emphasize, suggests, since it's not a proven theory -- but it suggests that there's at least one more layer to the story. Inside an electron, inside a quark, inside any particle there is something finer, and string theory proposes it's a little tiny filament, this little filament of energy, kind of looks like a string, that's why we call it string theory, and this little filament of stringy energy can vibrate in different patterns, just like the strings on a musical instrument, a guitar, they can vibrate in different patterns, and [just like] those vibrations [produce] different notes of music, the little strings in string theory may vibrate in different patterns that give us different particles. So the beautiful idea, the truly beautiful idea is that an electron, [for example,] is a string vibrating in one pattern, a quark is a string vibrating in a different pattern; a photon is a string vibrating in a different pattern still. But everything in the universe would be described as being vibrated into existence by these tiny oscillating strings. Jeff Salomon asks a question that mentions TOE but can't be heard. Brian Greene. I think I go on to explain in a little bit more detail what that claim means. What that claim means is, we often are able to describe all of the particles that make up matter, and all of the forces by which those particles interact with each other. Because, just to give you an example, the electromagnetic force -- you're all familiar with it -- magnets, electricity going through wires and so forth -- that force is actually intimately connected with light. Light is electromagnetic radiation. Light itself is [made up of] photons, and photons are strings vibrating at a particular pattern. The electromagnetic force communicated by photons would itself be described in terms of vibrating string. Cause the matter making up you and me would all be described as vibrating strings. [And forces too] would be communicated by vibrating strings. But if you talk about the fundamental ingredients making up the world, and the fundamental forces by which those ingredients influence each other, there ain't a whole lot left [outside of that]. Jeff Salomon asks, can you ask if there's anything smaller than a string? I.e. do strings themselves have structure? Brian Greene. Well, yes, you can ask, are [strings] necessarily the end of the progression from the table to molecules of the table, atoms of the table, to the electrons and quarks to strings, [or could there be] a further level of substructure inside the string itself? Could a string be made of something more refined? And the answer is, in principle it could, people definitely study that possibility today, but it isn't a requirement for the theory. So [this is] the first time I think we can say that a theory doesn't necessarily need something to [be complete?]. Every previous approach did this. Einstein, Maxwell, quantum theory always left something out. There always had to be something further. This theory doesn't seem to leave anything out, so at least in principle this could be the final layer to the story. But does that mean it is? No. It could be that there's definitely some still more deep description yet to be discovered, and maybe somebody here will one day [discover it]. Jeff Salomon asks something about where does the number of dimensions in the string theory come from. Brian Greene. Well, it is very tough to explain exactly the number of dimensions that the theory requires, but those that aren't familiar with it, I'll just give you the background. You know, string theory basically is the [unified] approach: [it seeks to] unify Einstein's theory of gravity, general relativity and quantum theory, and that is its greatest achievement; but when we study the math behind that theory, we find something pretty surprising, pretty shocking: the math doesn't work if the world has 3 dimensions of space. It doesn't work if the world has 4 dimensions of space. In fact, you carry through, it doesn't work unless the universe has 10 dimensions of space, plus one dimension of time -- 11 total space-time dimensions. That comes out of the math. Quite literally, this theory is claiming that in addition to left-right, back-forward and up-down there are new independent dimensions, and I don't mean like a direction or dimension between left-right or back-forward, or, rather, diagonal; no, I mean, literally, a new direction, a new dimension, independent of the three that we know about, but for some reason we are not aware of by direct observation. Brian Greene. Oh, you've got to bring up the little dark secret of string theory! String theory definitely is a work in progress, and prior to 1995 we knew this, that the equations that we were using were approximate equations. Those were the best equations that we could derive and develop with the mathematical techniques that were available prior to 1995. After 1995 new, refined, mathematical techniques were developed; and when the question of the number of dimensions was revisited, it was recognized that the previous math was too coarse to capture all the dimensions that the theory actually has. There was one hiding in the approximation scheme that we were using, and when we were able to clear away those approximation schemes and reveal more precise math, that revealed 11 dimensions. Jeff Salomon says something similar to: Is it possible that what you guys are doing is swimming in theory and hoping you won't drown? Brian Greene. Oh, we are definitely swimming. We are neck-deep in quicksand. We are absolutely hoping that theory leads us to truth. And why do we think is that a reasonable thing to do? Well, the history of physics in the last 300 years teaches us that whenever you resolve a conflict, an existing conflict in the laws of physics, when you resolve a conflict, that generally takes you to the next and more deep level of understanding. Certainly we saw that for instance with Einstein, who resolved the conflict between Maxwell's electromagnetic theory and Newton's ideas about how space and time behave. That resolution gave rise to the Special Theory of Relativity, whose centennial we're gonna celebrate in a month. Brian Greene signs his books after giving a talk and Q&A at a Barnes & Noble in Austin while promoting his book "The Fabric of Cosmos" in March of 2005. Einstein resolved another conflict between his own special theory of relativity and Newton's theory of gravity. He resolved that conflict after 10 long years of work and gave the world the General Theory of Relativity in 1915, again -- an amazing step forward in understanding the universe. That set up another conflict, between the young science of general relativity and the quantum theory. Law of gravity versus the laws of small entities. And for many, many, many decades this physics has been trying to fix that conflict. Couldn't do it. String theory for the first time [is showing us how to] resolve that conflict, so we suspect, following the pattern, that it is taking us to the next and more deep level of understanding the universe. But again, we'll only see the true theory once it's experimentally proven. We are absolutely aware that that is what is required. Jeff Salomon. Are there any experiments in the planning that would do it? Brian Greene. There are a number. There are a number of experiments that are planned, and I can name two just for the heck of it. So they are building this big accelerator, and what they're gonna do is they're gonna send particles around this tunnel, in opposite directions, near the speed of light, and [make them] engage in high-energy head-on collisions. And the hope is that in those collisions some debris will be created that can be ejected out of the our dimensions and enter into the other dimensions. How would we notice that has happened? Well, the idea is, compare the amounts of energy after the collision with the amounts you had before the collision, and if some debris got ejected out of our dimensions, you would expect that there'd be a little less energy at the end of the collision than you had at the beginning: some may have seeped away into other dimensions. It makes predictions for what you might see, and we're hoping that we will. That's one way, searching for the [...] feature of the extra dimensions. Another experimental [way], the tack that I'm following, is to use astronomical observations to try to test string theory. And let me just give you a quick analogy to say how that would work. It may sound crazy: strings are tiny - why look in the cosmos for evidence of tiny new hypothesized entities? Well, here's how you can justify this approach. Imagine that I have a little balloon. In a really fine point pen I write a really tiny message on the balloon, so small you can't see it. Now when I blow air into the balloon, as the balloon surface stretches, my little message gets stretched out along the surface, gonna become much easier to see, it's bigger. Take that idea and apply it to the universe. At the beginning of the universe, the universe is very small. Strings are very small, and they kind of have left a little imprint, or impression, on universe, too small to see. Then, through 14 billion years of cosmic expansion of space, the little impressions of strings get smeared out across space, much as my little scribble on the balloon gets smeared across the expanded surface of the balloon. So the hope is that the data supporting string theory may be out there by now, we might see it in our telescopes. Jeff Salomon. If this experiment works out, what will you do for an encore? Brian Greene. Some people have raised a possibility that in a sense, science is drawing to a close. That all that remains is to work out this or that minor detail, and basically, the end of science is near. That is SILLY. That is RIDICULOUS. If we were even successful at this most grand quest, to find the deep laws of universe, that would not mean we have come to an end, we would come to a beginning. [Here's a good analogy]: if you learn and master the rules of chess, is chess now over for you? No, it's now the beginning of chess. You can use your understanding of the rules to play the game. To strategize. To plan all manner of interesting moves and so forth. If we simply knew the rules of the universe, that wouldn't be the end, that would be the beginning. We would use that knowledge to try to figure out how the universe would reach the end, what really happens at the center of a black hole; can we manipulate space and time to [...] travel, both through space and through time? These are the kinds of questions that we could finally address with confidence if we had the unified theory at hand. And to me, that's where the fun begins, not where it ends. Jeff Salomon at this point has finished his part of the interview and invited questions from the audience. Question. You mentioned that you might concentrate on the younger audiences. [...] For those of us who are mathematically challenged, would you consider a book of 6 easy steps? Brian Greene. I heard the question but I didn't quite understand it. When you say "six easy steps", are you referring to Feynman? Yeah, you are. OK.
Brian Greene. If I understand correctly, you are asking, can one have a book which is actually perhaps as clear as some of the authors you enjoy reading, but maybe includes a little bit more of the mathematical detail that requires a little more mathematical prowess? If you looked at the "Fabric of Cosmos", in the notes -- I don't remember how many pages, but it's probably like 50-60 pages of notes, in which I have included some of the math on some of the points where people like yourself wanna actually see more of a math detail. undergraduate level, it's just been out by Barton [...]. It's not an easy book, you really need to know some undergraduate physics to understand it, but it's not at the graduate level like some other books are. So, I think, little by little people will start to fill in at the variety of levels, and I already see it happening with undergraduate books on strings. Question from a little boy. Why can't we observe the 10 dimensions of space? Brian Greene. Why can we not observe the 10 dimensions of space? (Pauses. The audience starts to laugh.) See? You were all thinking it, but you didn't wanna ask it, because you guys didn't want to embarrass [yourselves] with a question. But the young gentleman just wants to know the answer and that's fantastic. So why can't we see the other dimensions? Actually, that's a question that I have studied from the research point of view for nineteen years now, and there are 2 basic approaches. One is, the extra dimensions of space may be very tightly crumpled up to a very small size all around us, but so small we can't actually see them. And that's part of the picture, so let me just describe it using an analogy. Imagine you had a piece of paper. (Picks up a piece of paper.) On the surface of the page we all know that there are two dimensions on the surface, right? [You can say they are] left-and-right, and back-and-forth. Two dimensions flat on the surface of the page. But if you roll up a single piece of paper into a tube (he rolls it up into a tube), as you roll it up, it certainly still has two dimensions on the surface -- you haven't destroyed any dimensions by rolling it up, but you have changed the character of one of the dimensions. Now, if you could roll up that tube tighter and tighter and tighter -- there's a limit with how much you can do with a piece of paper, but imagine that you rolled up that tube so tightly that the circular part was so small that you just can't see it. You don't have the visual acuity to see it. You (addresses the boy) might be able to see it because you're so close, but people in the back of the room, they can easily see the left-right part of the tube, but they can't see the clockwise-counterclockwise part, if it's sufficiently thin. Imagine it's as thin as a piece of hair, a dental floss, or a blood capillary -- so thin you can't see it with a naked eye. Now, what does that example tell us? It tells us dimensions can be big and easy to see, but they can also be tiny and much more difficult to detect. Now, maybe that's true with the universe. It's got big dimensions that we can easily see, like the left-right part of the tube, but maybe just like the tube has a curled-up dimension that's hard to see with a naked eye, it's very small, maybe the universe has curled-up dimensions, very difficult to see cause they are so small, curled up all around us. We just can't see them with the eye or even with the most powerful magnifying equipment. That's one explanation. Does that help at all? The boy. Weren't they talking about in, like, the Nova show? Brian Greene. Weren't "they" talking about it in the Nova show? I think "they" were. (Audience laughs.) So, definitely, there's a resonance between the explanation that's given here and the one [given on the] Nova show. Absolutely. Question (could not be heard). Brian Greene. So the question is: I suggested one way we might look for these extra dimensions by doing a ion-[...] collision and having some energy ejected out of our dimensions into the others. The question was, could you also look for a similar kind of process in the cosmos at large, by virtue of a somewhat technical [...]: that if energy were to escape from our dimensions, the very foundational law, the Second Law of Thermodynamics, would not operate in a way that we ordinarily expect it to. Could that be another way of looking for the extra dimensions? I tell you, in principle, the answer is yes, in practice the answer is no, because turns out that the only entities we expect can be ejected from our dimensions are particles of gravity, graviton particles. Turns out that the string theory gives us an explanation for why that would be the case. I won't go into it now. What that means is, you need to have a sufficiently energetic collision that can produce those kinds of particles, cause it's not as though energy willy-nilly is being sent off of our dimensions into the others. It's only in very special circumstances that this can happen, and probably the largest [...] is so rare that, globally speaking, the second law would still be the second law, it wouldn't have some manifest departure from the second law that we could just look out and see. You really have to do a dedicated experiment in order to realize the possibility of ejecting things into other dimensions. Question. Either in your PBS special (Nova: The Elegant Universe) or in "Fabric of the Cosmos" you indicated that quantum theory indicated that neither space nor time is fundamental. What do you mean by that...? Brian Greene. Essentially, that's part of what the theme of the second book is about. And let me just give you a rough analogy of what we would mean by space and time not being fundamental. We all know what temperature is, right? We all know when something's hot, we all know when something's cold. Temperature is a macroscopic phenomenon we all experience, we all understand it. But we have also learned that temperature has a more fundamental description, that doesn't seem to involve temperature at all. What is that more fundamental description? Well, if something's hot, its molecules and atoms are moving fast. They bang into us, and that communicates a sense that something is hot. When something is cold, the molecules and atoms are moving slow. They bang into us at a slow velocity, it doesn't feel as hot. In other words, temperature is a secondary derived idea which rests upon more foundational explanation in terms of how quickly molecules and atoms are moving. 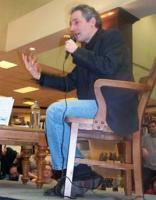 Brian Greene gives a talk and Q&A at a Barnes & Noble in Austin while promoting his book "The Fabric of Cosmos" in March of 2005. Now if you look at the motion of molecules and atoms, you [won't see] temperature; temperature emerges from that more fundamental starting point. Same way [with] space and time. Space and time, we think, are macroscopic features of the world that we all understand at some level, we all have some experience with, but they, we believe, rest upon more a fundamental substrate. The molecules and atoms of temperature, in other words, correspond to molecules and atoms of space and time. Now what those "molecules and atoms of space and time" actually are, I don't know. But just as motion of atoms bears no obvious, at first sight, relationship with temperature, we suspect that when they locate those fundamental entities making up space and time, there won't be any space and time obviously there. There will only be those entities so out, some appropriate, ordered, coherent state, that familiar ideas of space and time will emerge. So we expect, one day, that the laws of physics will not have space and time from the get-go, just like the laws of physics don't have temperature in them form the get-go, they have motion of molecules and atoms. That is what we are looking for. And when we get there, I think it's gonna be the next revolution in our understanding. Question. How do you reconcile the unified physical theory with all the psychic phenomena in the world? Another voice from the audience. Good for you! I like that answer. Brian Greene I don't reconcile it. I don't feel the need to reconcile them. I am interested, as a physicist, in those phenomena that are experimentally established, that had been replicated over and over again in laboratory conditions that we have complete control over. And if I understand the kind of psychic phenomena that you are referring to, I have never seen any evidence that those phenomena stand up to the kind of [scrutiny] that [would make me believe they are real]. Now, there are other psychic phenomena, namely, consciousness. I do believe in consciousness. I [just] don't think that's the kind of exotic phenomenon that you may have been referring to, and the unified theory, or string theory, doesn't say anything about consciousness. And again, I think, my answer right now is "no", and the reason is because I do believe consciousness is open to a question of physical/chemical properties and phenomena that happen in the brain. I don't think you need anything more [to understand what consciousness is]. But the physics of the unified theory talks about physics of tiny, tiny scales, and we don't know how to bridge the huge gap inside and complexity of something as big and complex as the human brain. So if string theory is correct, would we think that mental properties are [determined by] physics of string theory? I would say yes. But if you ask me to be more specific and lay down details, [neither] I nor any other string theoretician in the world could do that. So I don't think that addresses the issue you had in mind, but that's the best that I think you can hope for in terms of unified theory [explaining psychic phenomena]. Brian Greene repeats the question. If energy can escape through collisions into other dimensions, could the energy come back from the other dimensions sometimes and enter ours? The answer is yes, and in fact, some people may be familiar with certain problems that are known as the dark matter problems. For instance, a dark matter problem is, when we look at [the outer?] space, our measurements and observations held that there has to be more matter out there than we can see with our telescopes. We know it's there by virtue of the gravity that that matter exerts, but we don't see the matter. That's not necessarily surprising. The matter that's not giving off light would be dark. If it's dark, you can't see it. A big puzzle is, what actually is the dark stuff? [We need to] identify it and figure out what it is. And one proposal, an interesting one, is along the lines of: some physicists had studied the possibility that maybe matter in other dimensions, or, more precisely, in other branes is able to affect us gravitationally. In the same way that we can sort of send gravity out there by ejecting gravitons, maybe they can send gravity to us. Maybe excess gravity that we see is due to the matter that's not in our dimensions per se, but in some of these other dimensions. That's exactly along the lines that you think (addresses the person who asked the question). I've never been convinced yet by any of those proposals, but they are very much in the open stage, and I think that's a fascinating possibility. issue. So this is a lot of research that people are following, it's very exciting. Brian Greene. The question is, [what does] this very bizarre phenomenon called quantum entanglement mean for the notion of space? (He asks how many people know about quantum entanglement. Apparently most of the audience raises their hands.) [Maybe I should ask the other way:] how many people don't know about quantum entanglement? (Audience laughs.) The hardest thing in quantum physics is that you can no longer predict with the certainty the outcome of a given experiment. [Unlike classical] physics, quantum physics comes along and says, that was not how things work. The best we can ever do in an experiment is to predict a possibility, or likelihood, of getting one outcome or another. 30% chance you get this, 12% chance you get that, 4% chance you get this, and so forth. That is the best you can do according to our most fundamental descriptions of the universe, quantum physics. Let me give you an example of this. There are particles, electrons, I mentioned them before, most people know about them. These particles, it turns out, can spin more or less like a top. They can spin in a clockwise direction, which we call spin-down. (The microphone emits a long squeak. Brian Green looks at the microphone.) or they can make feedback, which we can call spin up. Are we back on? (addresses the B&N employees in charge of this event. Continues.). Or they can spin in any other direction, say, in counter-clockwise direction; we call that spinning up. So they can spin up and they can spin down. Here is the weird of the quantum physics. An electron, it turns out, can be in a mixture of both of those possibilities. (The microphone emits feedback again.) I guess I'm getting too excited and the mike... (Audience laughs.) I'll try to be [calm]. (He lowers his voice dramatically, doing an exaggerated impression of calm.) They can actually be... (Audience laughs). (Getting back to his normal voice): and they can actually be in a strange, fuzzy mixture of both spinning up and spinning down at the same time. In beginning, for example, there's a 50% chance that the electron is spinning up and 50% chance that it's spinning down. And it is in some vague, very strange, hybrid mixture of two possibilities, and only when you measure the electron does it snap out of the fuzzy quantum [state] and definitely choose either spinning up or spinning down. This is very strange, because we are unused to a reality that's ambiguous until measured. But I want you to accept this feature in quantum physics, because I wanna go on to something even stranger. The stranger thing is this. In 1935, Einstein [and his?] two colleagues Podolsky and Rosen realized [you can] actually have two electrons, not one -- two electrons set up in [the following] way. Each of them could be in a fuzzy mixture of spinning up and spinning down, half up and half down. Take the first one and put it in a box in New York, let's say. It's spinning up and spinning down, a fuzzy mixture. Take the second one and put it in another box in California, spinning up and spinning down. Let's say you go over to the one you already opened and measure; it snaps out of the haze and spins up. According to the quantum mechanical theory, at exactly that moment, the one in California will snap out of the haze and spin down, even though you did nothing to it. You can do the experiment the other way: go over to the box in California. The electron there is in a fuzzy mixture: half up, half down. You measure it, it snaps out of the haze and, say, spins up. According to the quantum mechanical theory, at that moment the one in New York snaps out of the haze and spins down. Strange. Long distance effect of some kind. Einstein himself called it "spooky". (Audience laughs.) Spooky action at a distance. You do something over here, and it seems to affect something over there, even though it does nothing at the distant location. Now, he was very happy when he found this implication of quantum mechanical theory, cause he really didn't like quantum mechanics. And he wanted to find some prediction, some implication of quantum theory that was so crazy, that when he showed it to those who were developing quantum theory, they would say: Einstein, you're wrong. Any theory that makes such a crazy prediction can't be right, or can't be complete, or needs to be further developed. So he showed this result to those who were developing quantum physics, and at first they kind of [stared] at it a little bit: "what?". But then they came back, and said, "well, you know what, maybe that is how the world really works". Who's right, who's wrong? Well, you can't just theorize, you have to do an experiment. In 1930s you couldn't do it. In 40s, 50s, 60s, 70s you couldn't do it. But by 1980 you could do an experiment, and an experiment was done. It measured an electron over here, it snaps out and spins up, the one over there snaps out and spins down just as quantum mechanics predicted. So not only is it a bizarre and crazy prediction of quantum mechanical theory, but it is confirmed by experiment. This is how the world works. Now, what do you need make of it? Now I'm finally coming to your question. I'd like to interpret this, and I take others agree with me, as challenging the most basic defining characteristics of space. When you think about space, generally, I think, most of us will agree that space is that medium that separates objects. Two objects separated in space are independent, they are autonomous, the can act without relevance to the other, because they are separate. But here's an example of two distinct particles, separate in space, but they can't act autonomously. Quantum mechanics entangles them, makes them act as though they are part of one physical unit, one physical system. So in a sense, quantum theory can thread through space [...] challenges the very notion that spatial separation ensures physical independence. The space, in a sense, can't be thought of as [...] because spatial separation does not mean things are separate. So, how would I wanna do this? As some of you may know, the Higgs field is a field that we believe permeates all the space, fills all of the universe. I sometimes refer to it as Higgs ocean. The Higgs field is very critical to modern theory because we believe it is what gives mass to particles. Now, how do you incorporate it into string theory? Well, in string theory the Higgs particles, which is the fundamental entity making up the Higgs field, would be a string vibrating in [a specific] pattern. Again, the unifying notion of strings is wonderful, because the same set of [concepts] applies to every particle. Electron: a string vibrating in one way, a quark: string vibrating in another. Higgs particles: strings vibrating in yet another pattern still. So what we expect is, there is a huge number of strings vibrating in a Higgs pattern, and all would be vibrating in a coherent, organized manner, which can fill out this uniform field that we believe exists throughout space. The only difference from the alternative, or I should say, previous [explanations] without strings is, now the entity making up the field is not a dot particle but a vibrating string. Question. (could not be heard). Brian Greene. It's a very good question. The question is, in my own work we are hoping that we are going to find... you know, [...] through string theory, through astronomical observation, how do we know when we have found it? What are those detailed observations that we are looking for? Well, there is heat left over from the Big Bang, known as the microwave background radiation. Again, how many people here never heard of microwave background radiation? Quite a few as well. The young universe was extremely hot, and as universe expanded, the universe cooled down, and cooled down to just a few degrees above absolute zero, but not exactly zero, and therefore there is this ambient heat, the ambient temperature throughout the cosmos, known as the microwave background radiation. In fact, if you wanna go measure some of it, you go home, unplug your TV from the cable, turn into an [empty?] station that has that nice static on your screen, and about 1% of that static is due to the radiation left over from the Big Bang. What scientists do is they build more sophisticated versions of your television set, send them up in satellites and measure not just the existence of the radiation, but the temperature, exact temperature of the radiation in different parts of the sky. Now, [according to] the string theory there is a prediction that the temperatures can be almost uniform, but there could be tiny differences in temperatures due to the jitters (?) of quantum physics. Those temperature differences now have been found. Amazing, a wonderful story, it's one of the chapters in the new book. Wilkinson Microwave Anisotropy Probe has seen those temperature differences. We are predicting that there should be yet finer temperature differences than the ones that have been found. So the hope is that very, very precise measurements of that temperature, very precise versions of the television set in satellites in orbit will one day be able to measure those predicted temperature differences, and they will fill out a pattern, we hope, that is, one, [compatible with] and suggested by the string theory.